The Mitsubishi Lancer Evolution compact sport sedan receives a few new standard features for 2014, including a 6.1-inch touchscreen display, HD radio and SiriusXM satellite radio. In addition, the Evolution's optional MMCS navigation system now includes a 7-inch display, 3D mapping and real-time traffic. Other than that, the Evo rolls into 2014 unchanged. Based on the Lancer sedan but far outpacing its lower-end namesake, the Evo rockets from 0-60 mph in around 4.5 seconds, thanks to its turbocharged and intercooled 4B11 T/C 4-cylinder engine, which pumps out 291 hp. The Evo comes standard with the automaker's Super All Wheel Control (S-AWC) all-wheel-drive system and an active center differential, which help keep the sedan agile yet firmly planted on the road during aggressive maneuvers. In addition, the Evo's cabin includes such sporty features as Recaro front bucket seats, aluminum pedals and a leather-wrapped steering while, while 7 airbags, including a driver's-side knee airbag, are among the standard safety features. The Evo has gone through numerous redesigns and updates since its introduction in 1994, and Mitsubishi continues to fine-tune many of the Evo's attributes on the international rally car racing circuit. The current version, available in GSR and MR trim levels, displays that rally car racing heritage in a number of ways. An aluminum roof, aluminum body panels and an aluminum hood with air vents help reduce weight, while the large front grille with black mesh inserts and large side air dams ensure good airflow to the engine compartment. Flared wheels wells make way for big 18-inch tires, while strategically placed side vents allow airflow to the wheel wells while venting heat from the engine compartment. Similarly, a rear wing spoiler on the GSR and lip spoiler on the MR redirect air flow and ensure appropriate downforce at higher speeds. Front foglights, power side mirrors and dual exhaust finishers come standard on both trims. The GSR receives halogen headlights, while the MR upgrades to HID headlights. Under the lightweight aluminum hood, a 2-liter MIVEC turbocharged 4-cylinder engine, now in its sixth year, continues to power the Evo. The 291-hp engine puts out 300 lb-ft of torque, which peaks at 4,000 rpm. The engine links to a 5-speed short-throw manual transmission in the GSR and a 6-speed dual-clutch Sportronic Shift (TC-SST) automatic transmission with paddle shifters in the MR. Fuel economy numbers check in at 17/23 mpg with the manual shifter and 17/22 with the automatic. The turbo powerplant joins with the Evo's performance-oriented chassis and suspension, which includes MacPherson struts, Eibach springs, Bilstein shock absorbers and a big 25mm stabilizer bar in the front (23mm in the rear), to provide sport-oriented handling. In addition to the S-AWC system, the Evo comes standard with Active Yaw Control, which adjusts torque between the rear wheels to ensure optimal traction and stability. Hydraulic rack-and-pinion steering provides good feedback, while ventilated Brembo brakes deliver strong stopping power. Both trims get 18-inch aluminum-alloy wheels and performance tires, with the MR upgrading to BBS forged aluminum-alloy wheels. The Evo's primary competitor remains the Subaru WRX, particularly the STi, and the numbers between the two vehicles match closely. Both feature turbocharged 4-cylinders, and both double as everyday drivers while opening up nicely on straightaways and curvy roads. The Evo's 291 hp falls a little short of the STI's 305, but comes out on top with its 300 lb-ft of torque, compared to the STI's 295. However, the STI weighs less than the Evo, tipping the scales at 3,373 pounds to the Evo's 3,516. In power and weight, the STI has the advantage, but the Evo manages to get off the line a little quicker, besting the STI's 4.7-second 0-60 time. The Evo's strong torque drives it off the mark, and turbo lag remains minimal, resulting in smooth, quick acceleration. Reviewers also give the Evo's handling a big thumb's up and rank it near the top of its class. On the downside, the Evo remains noiser than the STI, and the STI offers a more comfortable interior. Pricewise, the Evo starts a few thousand dollars lower than the STI. Other competitors to the Evo include the BMW 3 Series and the Volkswagen Golf R, which also comes equipped with a turbocharged 4-cylinder and all-wheel drive. Like the standard Lancer on which it's based, the Evo's cabin remains one of its weakest points. Mitsubishi dresses up the interior with sport-oriented features like well-bolstered Recaro front seats with sport fabric or optional leather upholstery, as well as aluminum sport pedals, a leather-wrapped shift knob and a leather-wrapped steering wheel with silver accents. Some padding on the armrests and doors helps elevate the Evo's cabin above the base Lancer's, but too many hard plastic surfaces remain, putting the Evo a step behind the competition when it comes to interior comfort. The new 6.1-inch touchscreen serves as the display for the Evo's 6-speaker, 140-watt audio system, which includes HD radio and SiriusXM satellite radio, as well as for the optional navigation system, updated for 2014. The audio system and display screen integrate with the automaker's FUSE hands-free communications system, which includes a USB port, Bluetooth and steering-wheel-mounted controls. Remote keyless entry, high-contrast gauges and automatic climate control are among the other standard features. Options include heated front seats and a 9-speaker 710-watt Rockford Fosgate audio system, available on both trims. In addition to 7 airbags, standard safety features on the Lancer Evolution include active stability control with traction control and sport antilock brakes with electronic brakeforce distribution. The base Lancer was named a Top Safety Pick for 2013, which should roll over to 2014, while the NHTSA gave the 2013 Lancer an overall safety rating of 4 out of 5 stars. 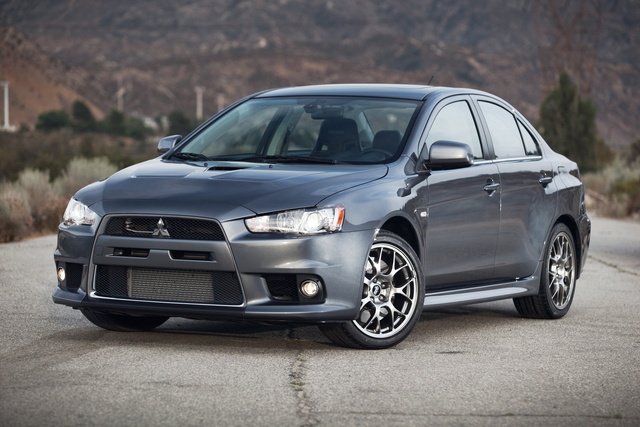 What's your take on the 2014 Mitsubishi Lancer Evolution? 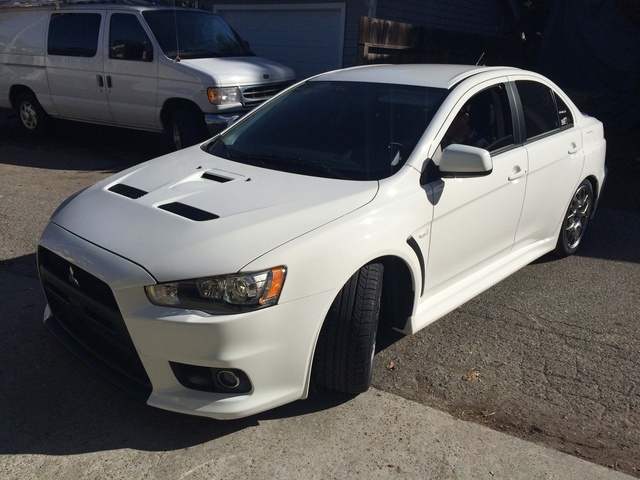 Have you driven a 2014 Mitsubishi Lancer Evolution?